Rental car Dublin from $ 12/day - Cheap thanks to price comparison! Dublin and its surroundings are perfect to discover by rental car. The easiest and most convenient way to travel around the country is definitely with a car from the car hire company at the airport or located in the city. With Driveboo, you can easily compare different car rental offers and book your rental car directly online. Dublin is the largest city of Ireland (Eire) and the capital of the country. It lies in eastern Ireland, at the mouth of the River Liffey. The river, flowing through the city, divides it into two parts, and then flows into the Irish Sea, creating excellent conditions for sailing and tourism. Dublin is an important industrial centre of Ireland, specialising in metallurgy and machinery. However, the most popular product of the city is definitely Guinness – a dry stout whose production started in 1759 in Dublin. Ireland is a year-round destination. However, the sunniest months are May and June. In Dublin, there are many car hire companies set all over the city. There definitely will be no problem finding one in any given area. However, if you travel to the city by plane, the easiest way will be to pick up your rental car directly at the airport. In the city itself, there is one major airport – Dublin Airport (DUB), which is located only 10 km north of Dublin. Many low-cost airlines also provide flights to Cork Airport (ORK) and Shannon Airport (SNN), from both of which it takes only a couple of hours to get to Dublin. At each one of the airports, you will find numerous car rental companies offering many different car types in affordable prices. What insurance do I need for my rental car in Dublin? Every rental car in the European Union must be covered by civil liability insurance, valid in all Member States. This insurance should be included in the rental price. You can also purchase a non-compulsory insurance covering other types of risk, such as driver's injury, vehicle damage, theft, vandalism or legal aid. You should always carefully read the terms and conditions of the rental agreement in order to be sure what kind of protection you will be provided with. What should I know before renting a car in Dublin? In Ireland they drive on the left. For drivers accustomed to right-hand traffic, travelling on Irish roads may prove to be a challenge. Remember to always turn left while entering a roundabout. It is mandatory for both a driver and passengers to wear safety belts. It is also forbidden for children under the age of 12 to sit in the front seat of the car, unless they are secured by a safety device suitable for their height. What are the speed limits in Ireland? What is the legal alcohol limit in Ireland and Dublin? The permissible limit of alcohol for experienced drivers is 50 mg of alcohol per 100 millilitres of blood. A lower limit applies to professional drivers, people learning to drive a car and new drivers, and it is set at 20 mg of alcohol per 100 millilitres of blood. Dublin is an amazing city for sightseeing. There are, however, a relatively small amount of older monuments in the city. One of them is the Castle of Dublin, built in the 13th century by the Normans on the site of former Viking fortifications. However, its present appearance has been achieved during reconstruction works in the 18th century. Near the castle, on its west side, you will find the Christ Church Cathedral, originally founded in the 11th century. Another cathedral in Dublin is St Patrick’s Cathedral. Both of them are owned by the Church of Ireland as part of the Anglican community and are available to visitors for a fee. Another must-see of Dublin is definitely the Guinness Brewery. On its top floor there is a pub overlooking the city, where you can enjoy some delicious dry stout. 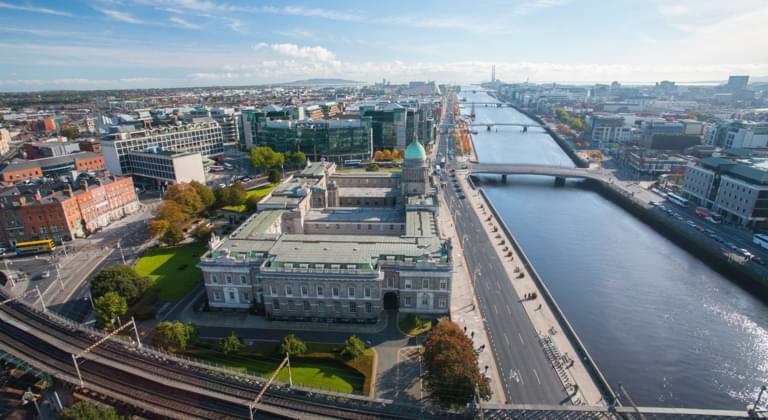 In the surroundings of the Irish capital, you will find countless tourist attractions, which can be easily reached by car during a day trip or a half-day trip. One of the most interesting destinations is the Howth Peninsula. It is located on the northern edge of the city and can be reached by car quickly and conveniently. You can park your car at the picturesque harbour. Afterwards, you can explore the unique cliff landscape of the peninsula on several hiking trails or enjoy some fish and chips in one of the local restaurants and pubs. If you are looking to visit typical Irish countryside, drive to the Wicklow Mountains National Park. The picturesque mountain range is just outside the city gates. Here, you can go hiking and fishing or visit the ruins of the monastery of Glendalough. If you want to visit the Irish Sea, drive to Killiney Beach in the south of Dublin or Malahide, north of the city.